» The Full Jetboil Genesis Review – All You Need to Know! The Full Jetboil Genesis Review – All You Need to Know! When you’re setting out on an ambitious camping trip, you want a reliable, efficient and easy-to-assemble stove for those exhausted moments after setting up camp. Unfortunately, with so many options on the market, it can feel overwhelming deciding which model to go with. To help your search, we’ve outlined the necessary attributes for any great stove, and we’ve even reviewed one that we believe outperforms the pack. You may feel inclined to trust a camp stove’s cooking power before you see it in action, but don’t jump to conclusions. Camp stoves widely vary in their ability to cook your food. Factors such as wind resistance, heat retention, and flame diffusion can drastically affect your stove’s power. We suggest you do your research beforehand and test out the stove before committing to such a crucial piece of your inventory. The second most important trait to consider is the stove’s transportation capacities. How well does the product store? Is the carrying case compact or bulky? When hiking for extended periods of time, the last thing you want is a heavy pack. You need to cut those extra lb’s wherever you can, and while a camp stove is an essential item, a heavy one is not. Countless companies offer smaller, compact models that can drastically reduce your weight load. Just make sure to consider the pros and cons before purchasing a stove, for a while some stoves might weigh less, their flames may not burn as bright. Does the camp stove come with a pot? A pan? Silverware? Or is it merely the burners? When purchasing your stove, make sure to calculate any subsequent costs. Yes, a stove that comes with pots, pans and silverware may cost more, but the price may prove superior when compared to a kit that comes with nothing but the burner. The more add-ons your stove requires, the more storage space you’ll forfeit. Also, complimentary items rarely fit together for storage, whereas complete kits often combine to minimize their cubic footprint, making your life a whole lot easier. How long does assembly take? Is it match-lit or does it use a quick-starter? Depending on your adventure, weather may not always prove favorable. If you’re in a bind and need some quick food, you need a stove that requires little assembly. If your stove requires a match-lit ignition, then you need to remember to pack matches or a lighter, which isn’t always the first thing on your mind when traveling the world. A quick-starter stove, built with push-button ignition, almost always proves the better option. However, in some cases of extreme weather or overuse, a push-button ignition may still require the assistance of a match or lighter. Released in 2015 but still reigning supreme, The Genesis Base Camp System is one of few models on the market that has proven itself a far superior product than its competitors. 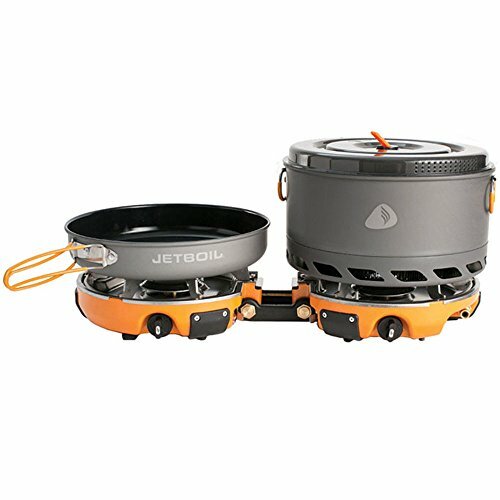 Listed online for $349.95 (check this listing for the latest live prices), the Jetboil Base Camp System is a lightweight, portable, and highly efficient dual-burner stove. 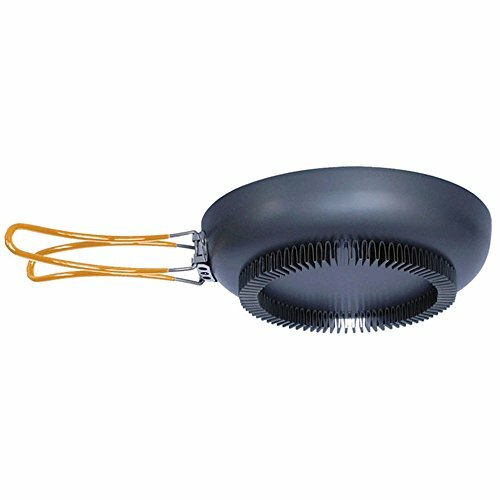 The product exceeds market standards and revolutionizes its field with an unbelievable simmer setting and assembly time. The Genesis base camp system is the world’s first of its kind. With a frying pan, pot and two burners in its kit, the Genesis system break down into one 8.5” by 10.75” inch bag. The compact bag has a shoulder strap as well as a side pocket adapter for a regulator fuel connection. At only 9 pounds, no space is wasted, leaving hikers room for extra food, water, and other essentials. The lid of the Genesis Base Camp doubles as a 10” ceramic coated frying pan. 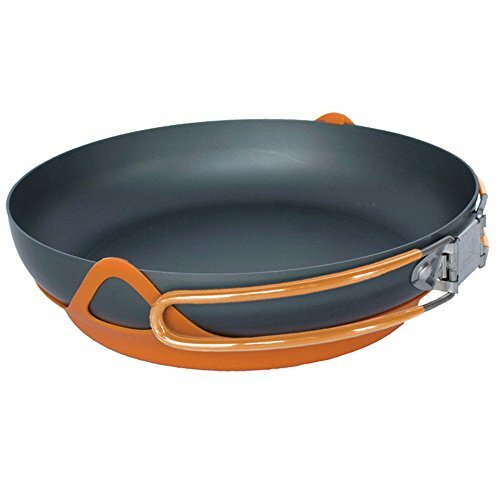 The eco-friendly, non-stick pan utilizes high walls and a large base to capture heat for quick cooking results excellently. The pan is easy and quick to clean from use to use. If cared for properly, it should last you years without problems. Perhaps the Genesis Base Camp’s best feature comes in its simmering abilities. An adjustable flame knob spins in four full rotations, ranging from its lowest to highest setting. At its lowest level, the burner expertly simmers small meats and vegetables. Most Genesis owners claim that the burner even trumps their household stoves when it comes to simmering bacon, ham, and other hiking essentials. The bottom of the Genesis Base Camp serves as a pot for boiling water, instant soups or stews. The 5 Liter pot sits comfortably atop each burner and utilizes Jetboil’s revolutionary flux technology for maximum efficiency. Much like the pan, with proper care, the pot should last you through to the end of your hiking days. With durable material, slick surface and excellent heat retention, the pot add further value to the Genesis Base Camp System. If you’re not familiar with Jetboil’s FluxRing technology, then you’ve got some much needed catching up to do. The advanced technology comes in the form of a dense metallic ring that is folded over itself nearly 100 times. The overlapping metal exponentially increases surface area and thus maximizes heat retention, saving you time and gas. 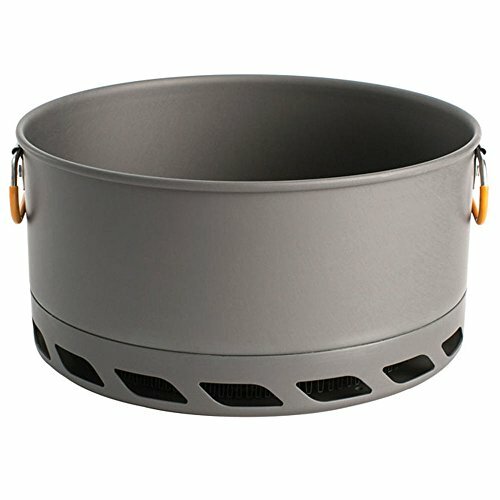 As part of the Genesis Base Camp System, the FluxRing is built into the framework of the pot, ensuring that your meals are ready to eat as quickly as possible. 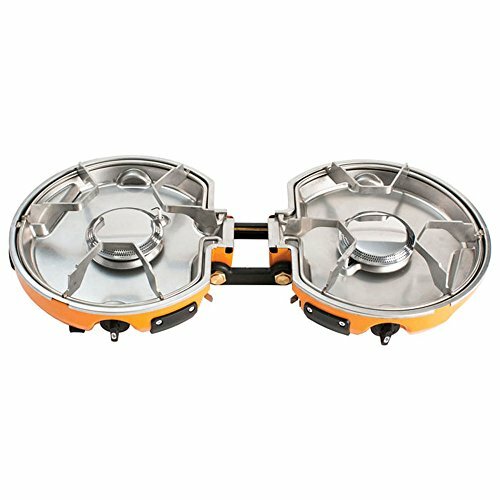 Not only does the Jetboil Genesis Base Camp require only fifteen seconds of assembly, but once assembled a lever ignition removes the need to carry a spare lighter or pack of matches. In fact, the Genesis system so efficiently utilizes its fuel that sometimes it’s hard to tell if the burners are ignited. To test the flame, simply run your hand safely over the burner, and you’ll know right away. 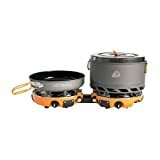 Outfitted with a patented, Jetlink fuel output, the Genesis Base Camp System can accommodate any and all Jetlink compatible stoves. The unique port also connects to a Luna satellite burner, which comfortably holds a Jetboil Zip or Flash container. In case of necessity, the Genesis Base Camp System comes with an attachable windscreen. The windscreen, which takes only moments to assemble, prevents protection from unwanted wind resistance in more inclement weather. While priced higher than most of its competitors, the Genesis Base Camp system will outlast and outperform nearly all other cooking systems on the market. Excellent cookware and a compact carrying case makes the Genesis System a perfect item for family and group camping trips. Furthermore, minimal assembly and complimentary products turn the Genesis Base Camp System into a rare, but spectacular product. We recommend the system to any serious hikers looking to log some nights under the stars. Best For Group Hiking Trips.